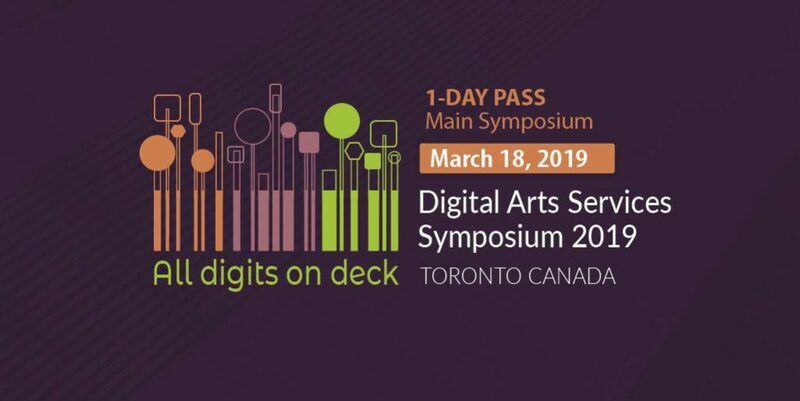 1-Day Main Symposium Passes (Mar 18) at the second Digital Arts Services Symposium 2019 are now on sale! Group-rate discounts are available when booking 2 or more passes at the same time. These discounts are automatically applied to the cart during the registration process. Visit Pricing for details on the discounts available. All advertised prices are inclusive of taxes and processing fees. For delegates experiencing financial difficulties, a bursary application equivalent to $300 off the Individual 3-Day Symposium Pass from March 18-20, 2019 (with or without meals) is available now. There are limited bursaries available. They will be granted on a first-come, first-serve basis. Apply for a bursary now. A limited number of Pay What You Decide tickets are also available now. Passes without meals receive complimentary coffee, tea, or beverage service each day. Passes with meals receive daily continental breakfast and boxed lunch in addition to complimentary coffee, tea, or beverage service. Meal accommodation requests can include Pescatarian, Vegetarian, Vegan, and Gluten Free.